Carson loved basketball practice with the Trentwood Tigers until Daniel, the star player, started showing off and hogging the ball. When Daniel refuses to pass to Carson during a drill and then makes fun of him, coach Tony and coach Lauren remind Daniel to have a better attitude. But the team, including Carson, is still upset with Daniel. Things get worse at Trentwood's next game when Carson's teammates hurt their chances of winning by not passing to Daniel. As Carson sits on the bench, watching his team fall further behind and Daniel getting more frustrated, he knows he has a choice to make. Will he continue to be angry at Daniel or reach out to him? With his coaches' help, Carson learns that even though forgiveness can be difficult, it's the best way to make things right and move on. Join the Team! The Team Dungy series of picture books for young readers, ages 6-9, teaches character-building lessons through the familiar world of sports. 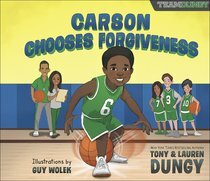 About "Carson Chooses Forgiveness: A Team Dungy Story About Basketball (Team Dungy Series)"